Fall is here and it’s the perfect time to get back into the gym, find a new fitness routine and get a jump start on your health goals. I train all year round with weight lifting, Yoga and a little Zumba. The colder months can bring challenges to a fitness routine and I’m excited to share with you some of my favorite gym bag essentials that I can’t live without. Hopefully I can inspire some of your gym bag essentials! My gym bag has been the home to many products, but these are the products that are essential to me and my gym bag. 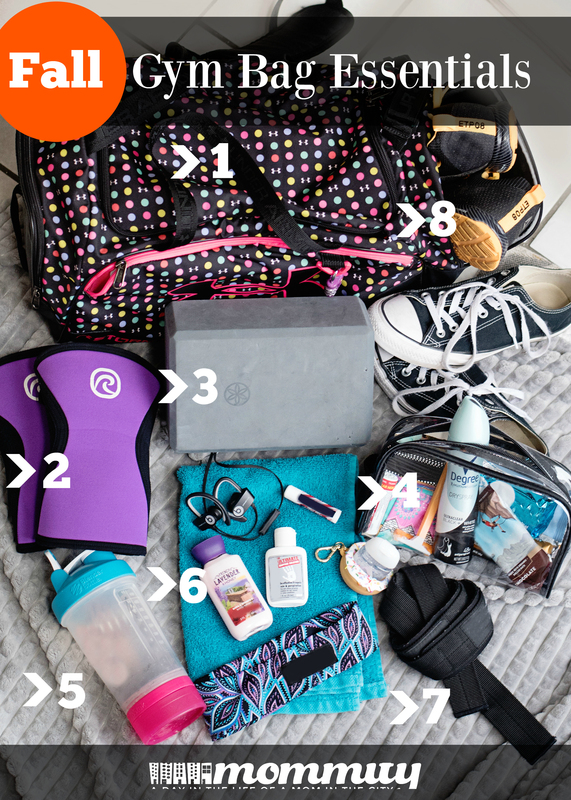 1 – The Gym Bag of course! A cute bag can often inspire me to make that trip to the gym, even when I don’t want to. 2 – Knee Sleeves. If you are into squatting as part of your fitness routine, knee sleeves are a savior during the colder months. When it’s cold out, warming up and staying warm is difficult. Knee sleeves will bring tons of warmth to the joints and keep them warm during your entire workout. 3 – Yoga Block. Stretching is essential, but even more so during the colder months. Muscles and joints get stiff and mobility is a little more challenging. I love the yoga block for helping me get into some of the more difficult stretching and yoga poses. 4 – Goodie Bag of Must-Haves! I keep a clear plastic tote in my gym bag filled with all of the little things that become huge essentials in the Fall. Make-up removers to remove foundation before working out. Removing makeup before sweating will help to prevent clogged pores and breakouts! Hair ties. I’ve forgotten hair ties and broken many at the gym. Degree® Dry Spray in Ultra Clear. Body odor at the gym is an embarrassment. You don’t want to be THAT person! 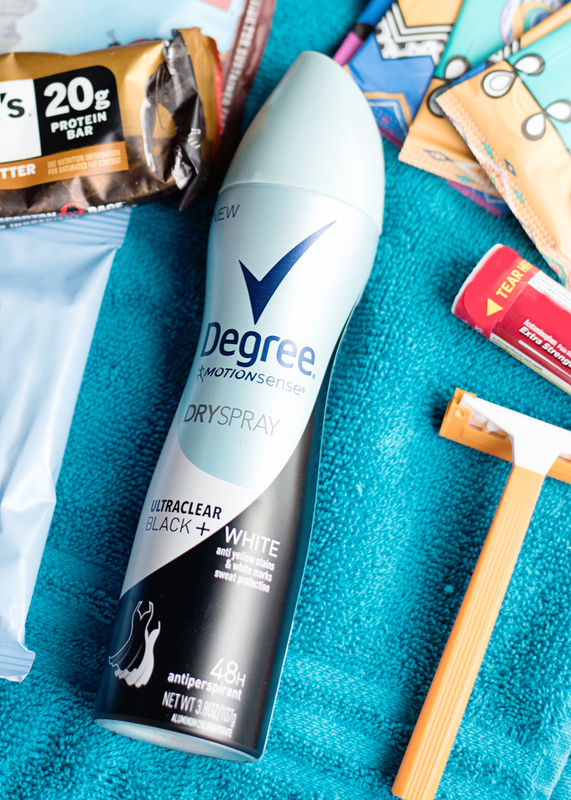 Degree® Dry Spray is made with MOTIONSENSE® Technology, giving you ultimate odor control. The more you move, the more it works. I go with the Ultra Clear because there is a ton of black in gym clothes and this keeps the white marks off of your tank tops and shirts. 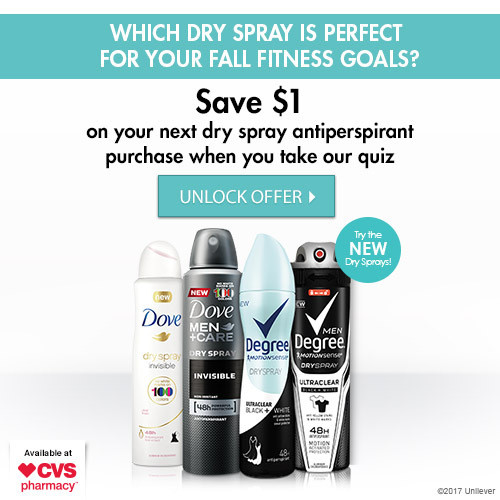 To add this to your gym bag at a discount, head over to www.cvs.com/trydry to take a quick quiz for $1 off. Also, when you visit CVS now through November 18th, you will get Buy 1, Get 1 50% OFF WITH CARD Select Axe, Dove or Degree® Dry Spray Antiperspirant products. Hurry! Feminine Products. Always keep a few on hand! Whether you have pelvic floor problems when squatting or deadlifting. Or if you happen to start your period AT the gym. These will always be handy. Pain medication. I’ve walked into the gym with a headache and had the worst workout ever. Never again. 5 – Water and Protein Shaker Bottle. These are a must during any season! Hydration is important and can often be neglected in the cooler months. 6 – Some of my favs! Bluetooth Headphones. No one wants to get caught up in cords. Sync some bluetooth headphones up, turn on a great song and have an awesome workout! Headbands. Cute headbands keep the sweat and hair out of your face. Liquid Chalk. If you are weight lifting, liquid chalk is a MUST in the Fall! It’s cold and flu season, you won’t find me sharing a block of chalk that has been touched by the entire gym community. Hand Sanitizer. Same as above. Everyone seems to think it is okay to come to the gym when they are sick. Keep yourself healthy, wash those hands and sanitize! 7 – Lifting Straps. These are in my bag all year round. Great for weight lifting! 8 – Shoes! Make sure you are working out in the proper shoes. I have canvas shoes for weight lifting and other shoes for cardio/plyo and conditioning work. The wrong shoes can make or break your workout. 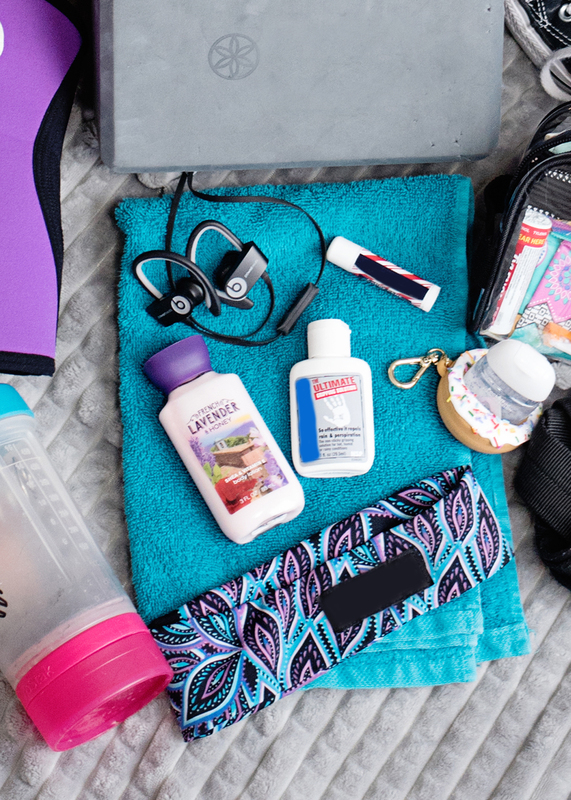 Which of these products will you be adding to your Fall gym bag?